Having a hotel, resort or hostel booking business is not easy. You need to have an effective website to help your customers book their next trip fast and easy. And because of this, you need to find the hotel website templates to help you create the best booking website to keep your customers coming back. In this article, you will find some of the best resort website templates that offer amazing features to make it easier for you to create your website. These templates are user-friendly so you don’t need to hire an expert to build a website for your business. You can post photos, arranged reservations and even start a social media marketing campaign on your site. There are lots of benefits these templates are offering and the good thing is that you don’t have to spend a lot on it. Other businesses may allow some mistakes but not in hotel and hospitality industry. It is designed on the perception of quality service and having a low-quality service is unacceptable. Keep in mind your customers will not be able to see your place right way. They depend on the reviews and how well your website was created. Make sure that when they search your website using a search engine, your website should be something impressive and will leave a lasting impression. Creating a website is not an easy task, but with the help of these website templates, you can build one in a snap. 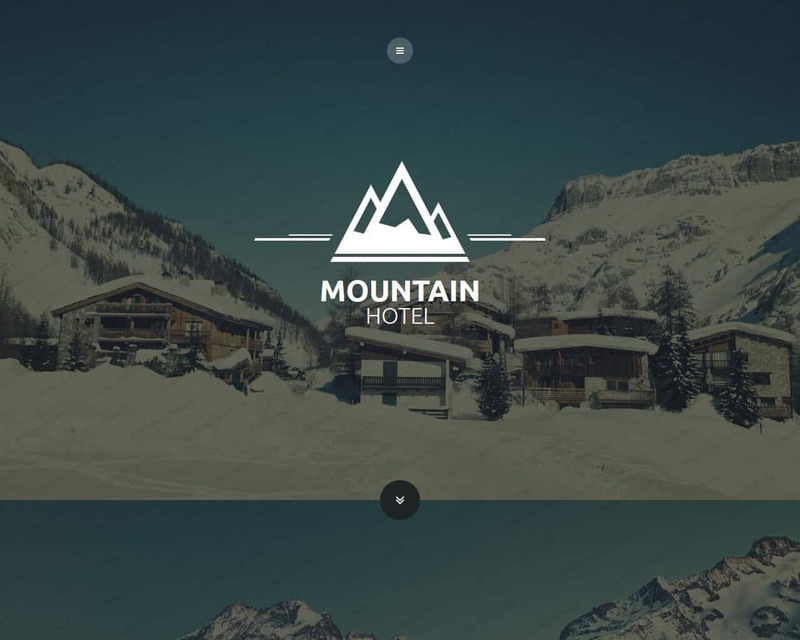 Mountain Hotel website template is a contemporary multi-purpose theme that is ideal for any hotel-related business like travel, architecture, interior and exterior design and other websites. You will not have a problem customizing it since it offers lots of customization options making theme management fast and simple. It includes a super fish drop-down and mobile menu, JS animation, and responsive layouts. You will be able to create a well-organized landing page. Your visitors will easily locate whatever they need since it is well-structured and has spontaneous navigation. This template is designed with a lot of preference given to the placement of images. If you own a resort or hotel near a mountain, this is the best template for you. Take advantage of what nature can offer you and feature it on your website using the Mountain Hotel template. Its parallax effect makes the images more lively and appeals greatly to your visitors. Expect an increase in bookings with this template. 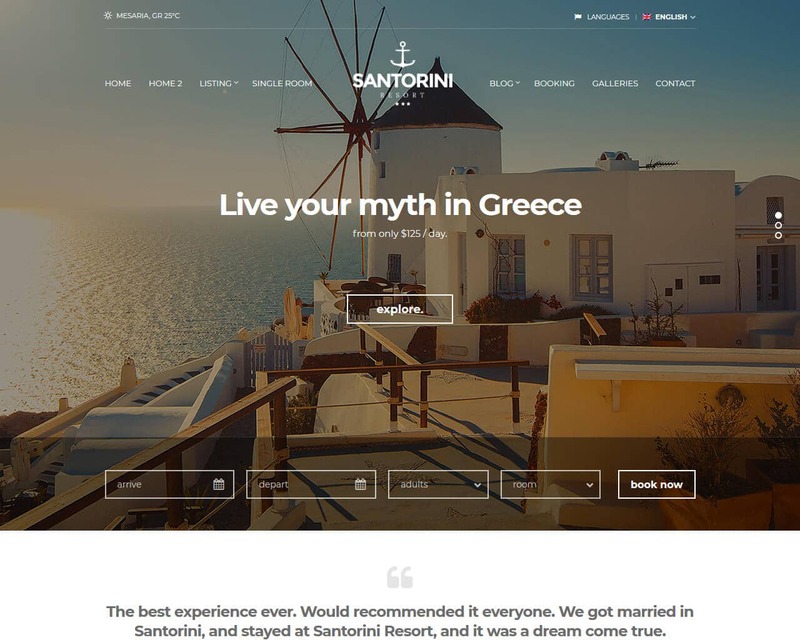 If you are looking for elegance and sophistication in your website, Santorini Resort website template is what you need. The developers created this template to cater the needs of resort and hotel websites. It is a very responsive template and has a retina ready design to make it accessible and display clearly on any device and screen resolution. Your website can be opened by your clients on desktops, mobile phones, and tablets without any problem. Some of Santorini Resort important features include dynamic weather reporting, photo galleries, testimonials, booking inquiries form, rooms templates, a customized widget for attractions, progressive choices panel, option to add your favorite booking system and customize option with 8 color schemes, CSS3 code, shortcodes and a lot more. Santorini Resort template has a unique design that assures you to promote your business image to a higher level. Its booking form enables your visitors to get in touch by using the template’s fully integrated booking request form. Some of its exciting features are four homepages, four gallery page, rooms, reservation, three blog page, 404 page, two contact page, services and a lot more. Your visitors can visit your website using a desktop, smartphones, iPad, iPhone, and tablets. It is equipped with great animations and Owl carousel. 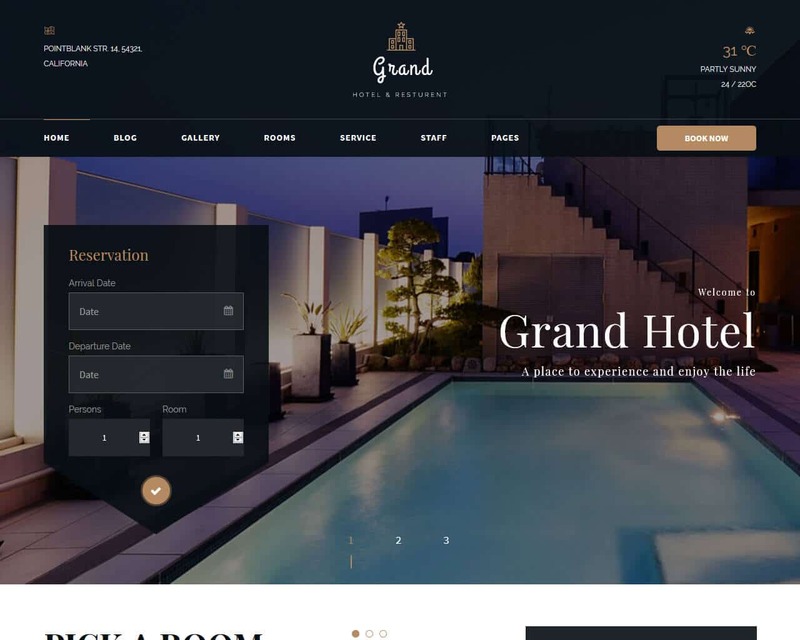 Your website will get the boost it needs if you use the Grand Hotel web template. 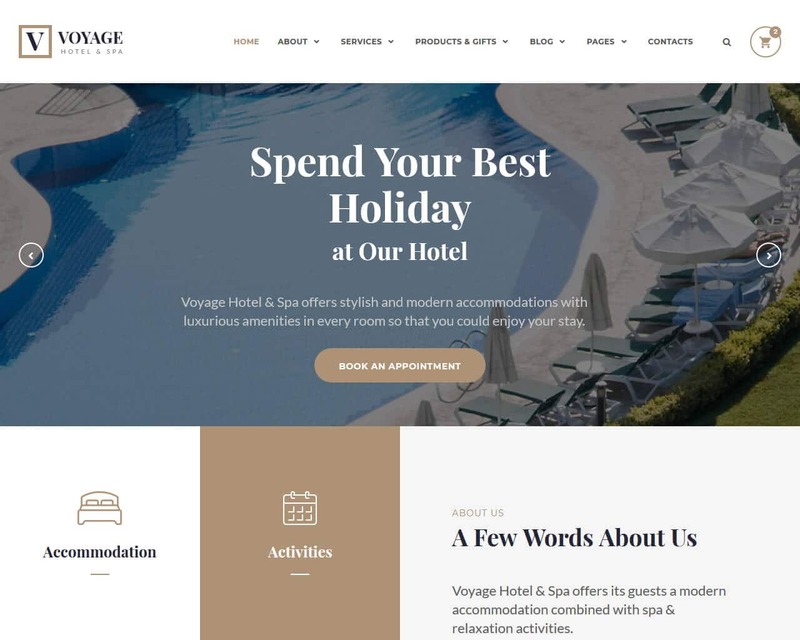 Voyage hotel website template is a web design that includes different helpful features that offer an easy to navigate and user-friendly interface. This template is designed to help you advertise your hotel room reviews or resort hotel. Voyage is definitely a responsive hostel service template perfect to help you create the best website for your template. You can easily access the website in any device and screen resolution. The website layout enables the different elements of the design to adjust according to the size of the screen. With the help of the additional features included in the package, you can easily modify the layout according to your business requirements and add content you would like. The Voyage template has a clean and well-structured design that enables you to share lots of content on a single page, without restricting its legibility. For issues and concerns, you can contact one of their well-trained assistant managers and they will make sure everything will be resolved fast. Voyage website template will help you improve your online business and increase your profit fast and easy. 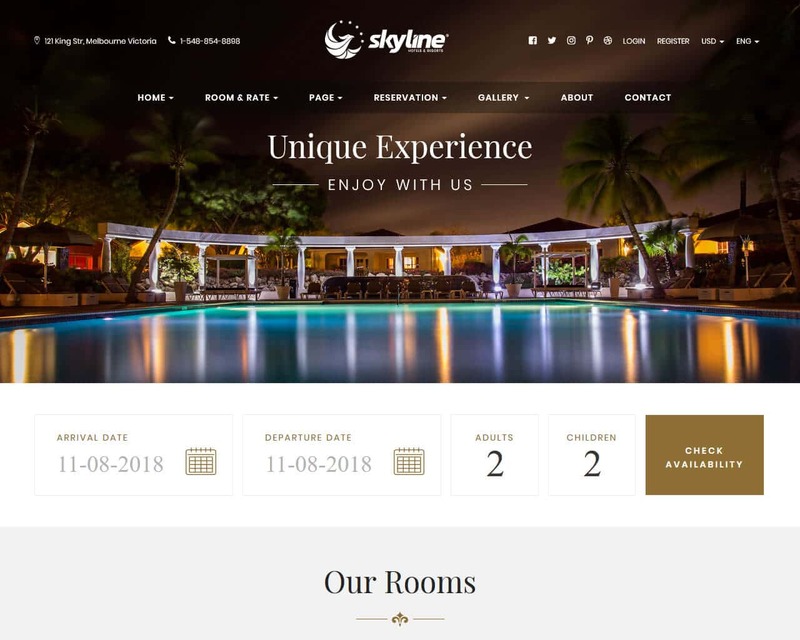 If you are looking for a modern and attractive template that is recommended for resorts, hotels, bed and breakfast, villas or any type of business associated to the hotel industry, the Skyline is a good choice. It is equipped with an eye-catching header with several built-in sliders at the banner. The Skyline offers a user-friendly interface and can increase your bookings with its advanced booking form feature on the home page. This template will help you create a beautiful and amazing hotel website and video that words cannot describe. Skyline website template includes a comfy reservation form, where your guests can book their future stay in your place. It is highly-optimized with mobile-first techniques and retina ready. This template is very responsive for individuals who use mobile devices most of the time like phones and tablets. Other amazing features are as follows - free support and updates, multi-browser compatibility which means it can create a shop for any client browser, banner slider and animations, shop layouts and a lot more. People are searching for a nice place to stay during their business or luxury trips. If you offer services related to this, you want to make sure that each visitor would feel better every time they visit your place. And to let them know of their services you need to create a website. Good thing there is the so-called website template that can make your task of building a website fast and easy. The Luxury web template is the latest and sophisticated tool loaded with great features to help you develop an amazing site. If you are just starting with your business or operating for many years, having a website is a must. Instead of hiring a costly professional service, use this template to create your website. This template does not require a degree in college. It is complete and easy to customize. Luxury offers 16 pages, 4 home variations and is equipped with MailChimp. Other features include revolution slider, working contact form, editable animations to help you decorate your final layout. 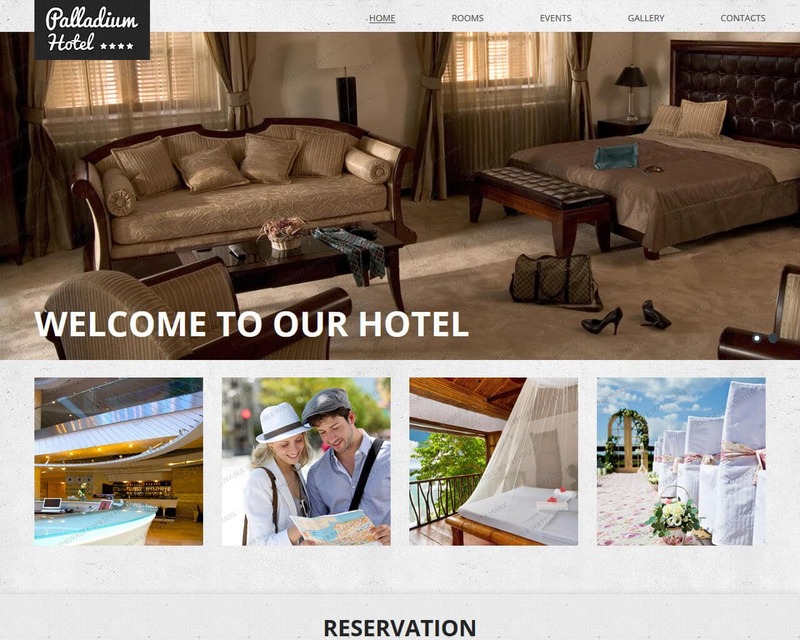 This premium hotel website template is based on the latest bootstrap framework. It is recommended for any type of accommodation, hostel, rent, resort, booking, rooms, travel, holiday, motel, reservation, vacation, tourism, and luxury. The template is very responsive which means you will not have any difficulty accessing it any device and any screen size. Whether your visitors use tablets, desktops or mobile to access your website, they provide all the same consistent user-experience. 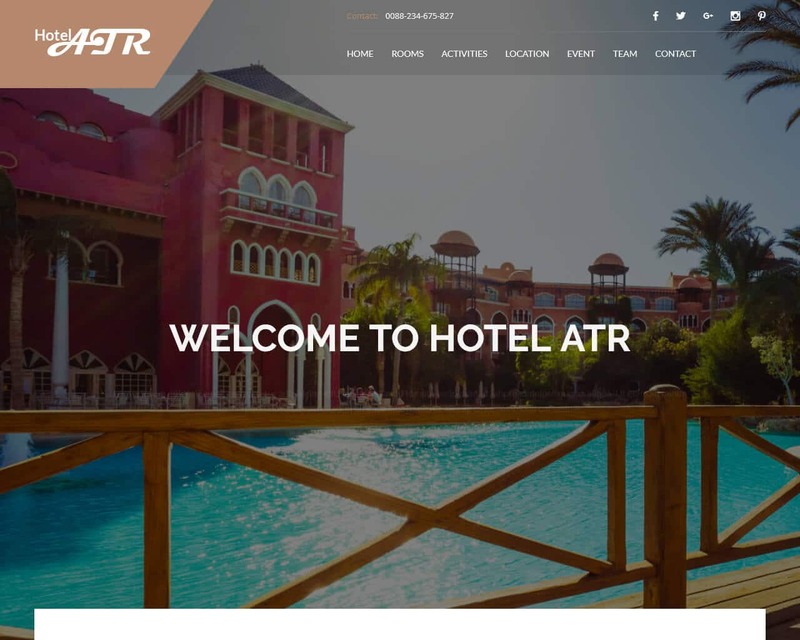 If you are in search of modern, clean and innovative hotel template, the Hotel Atr is perfect for your business. You can check out the free demo to test the different features of this template. It offers 5 hotel templates, 5 travel templates, and others. Compatible with different browsers like Chrome, IE10, Opera, Safari and Firefox. The template is well-documented so you will not have problems adding and removing details that will fit your business requirements. 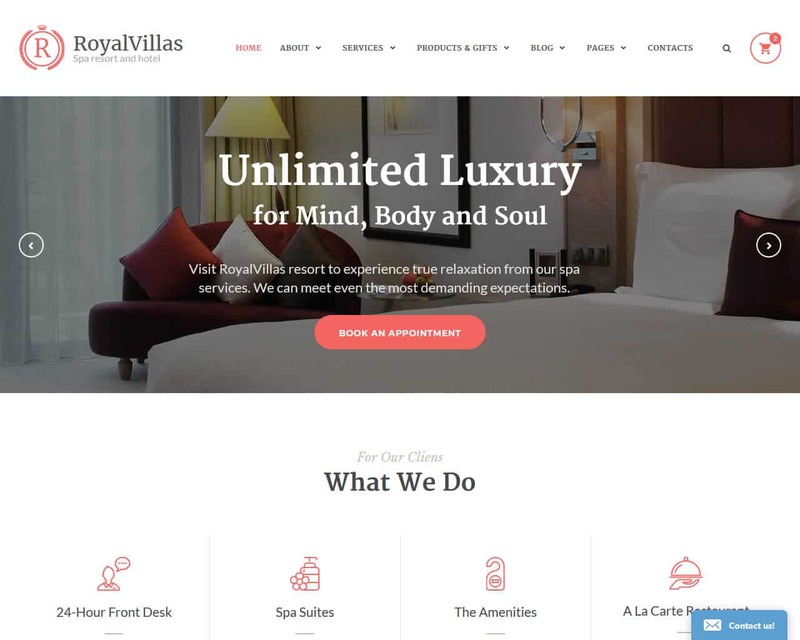 Royal Villas is a hotel website template recommended to businesses that involve resort, hotel, and hostel. Since this template has a multipurpose design, you can easily create your site it does not matter if it is a store or blog. Included in the Royal Villas package are ready-made pages for different purposes. You don’t have to start from scratch. Just add the information and content you want and Royal Villas will do the rest. The package includes both standard pages like team, history and FAQs and extras such as 404, 503 and coming soon page. Royal Villas also has different headers, footers, blogging layouts and gallery types that you can choose from. If you check out its loaded UI kit, you will discover several UI elements to showcase the content, from tables and icons to tabs and progress bars. An appointment manager is integrated into the template. It enables visitors to check the available time slots and requests a meeting accordingly. 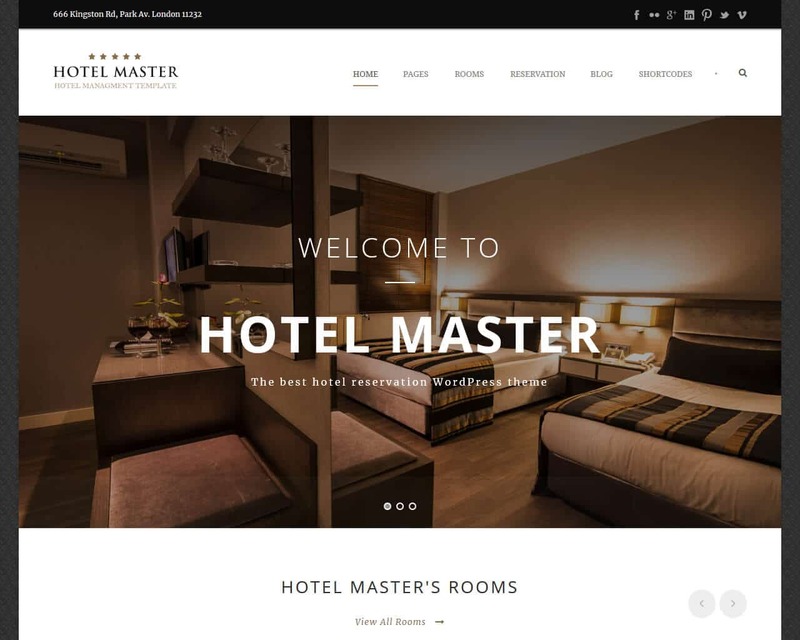 If you are looking for the best WordPress theme for hostel and hotel websites, the Hotel Master is a good choice. It enables visitors to check out your products and services by browsing the available rooms, before reserving it. This template has several market-specific features, and each characteristic optimizes accessibility and convenience. The template layout can adapt easily to any screen size because it is very responsive. There is no need to worry about resizing your website. This template is compatible in cross-browser and is available in two main theme variation - dark and light. It does not matter which theme you choose, the page will look amazing. You can create your site fast and easy if you use this template. When booking a room, the user can change his mind by searching other criteria. Refreshing is not needed, because of the template’s Ajax feature. 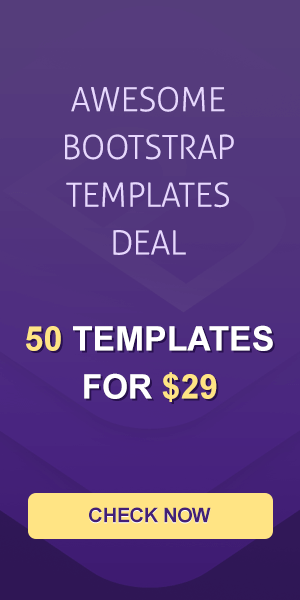 The template offers a coupon setting, and you can determine the expiration date of the coupon, coupon code, percentage of discount, and coupon amount. You can control every element. 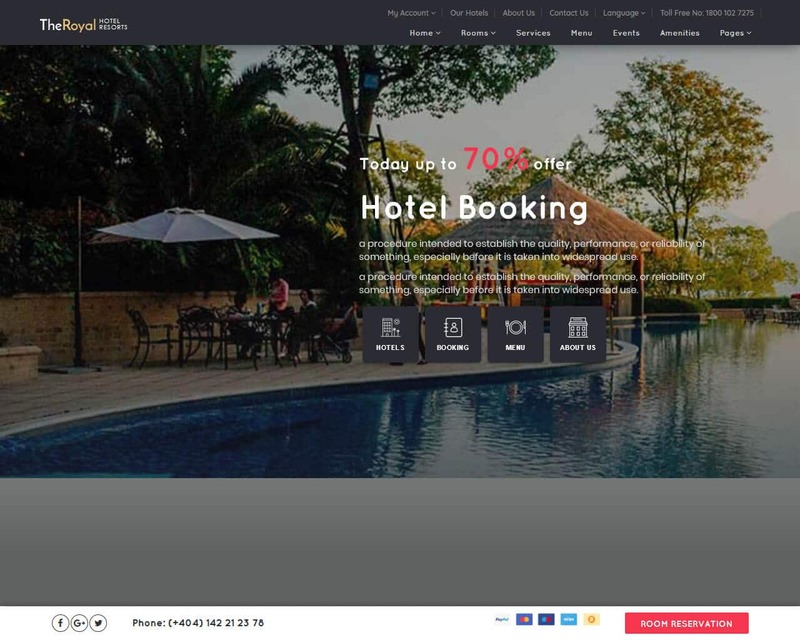 TheRoyal template is recommended for resort and hotel websites with 4 demos and a user dashboard layout. You will find pages for hotel detail, services, booking, rooms, and events. There are 40 of them for every part of your business website. The template makes use of the best technology to create an impressive website for your business. Your website will perform perfectly on all devices like desktop, mobile, and tablet. Users will not find any difference in site functionality, it remains first-class. TheRoyal is optimized to make it compatible with all search engines and for speed. The Royal works flawlessly any time you want. Booking form, register, login forms and quick reservation are the four vital features of The Royal which makes it on top of others. It also includes Google maps and Google fonts. There are lots of things you can benefit of by using this template. This template is designed for hotel reviews blog, resort reviews, and hostel booking. Hotels website template is an excellent theme for lodging reviews, hotel accommodation, and reviews. In order to get the traffic you will be needing for your website, the template is well-designed to provide the perfect user experience. They offer support for those who will encounter problems while building their website. The well-trained support will make sure the issues will be resolved fast no matter how complex it is. Choose this template to build a robust online business. To make sure that you are building a lively website, the layout includes Google web fonts. Your website will be unique since you will have access to a decent library of fonts that are easy to apply. Since the template is very responsive, your website can adapt easily to any devices with any screen size. The images and text are flexible, so they will show up correctly. This will definitely boost your conversion knowing that your visitors are not restricted when it comes to location or device. 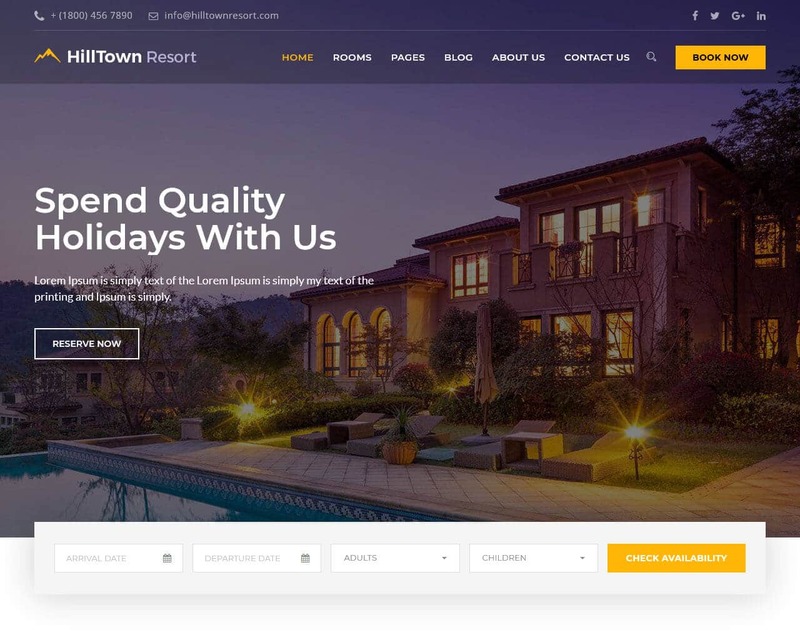 Hilltown is a hotel website template designed for bed and breakfast, accommodation, resort and different types of hotel businesses and who are into accommodation related business. The template has an attractive and unique design that fits your online web presence. It has a responsive design and is tested on different gadgets and other handheld devices. The Hilltown template comes with all the needed features for your effective online presence such as blog, facilities, room description page, testimonials and others. Hilltown is a great choice for your online presence. If you have plans on launching your website Hilltown is a perfect choice. HillTown template has a stunning and unique design that will benefit your website. Hilltown comes with mandatory options for your online presence such as weblog and other services. There are lots of features helpful to your website like totally customizable, working PHP contact form, compatible to most browsers like Firefox, Safari, Firefox, Opera, and Chrome, parallax backgrounds, and a lot more. This booking website template is a responsive and smooth app theme that is very flexible and easy to use. It is powered by a booking system plugin and advanced evolution plugin. This template is a single or multi-purpose booking and reservation system. It has room availability calendars, deposit options, payment options, seasonal rates, customizable booking form, and a lot more. Hotel Booking uses a script that enables you to develop a fully functional professional looking hospitality and hotel sites. 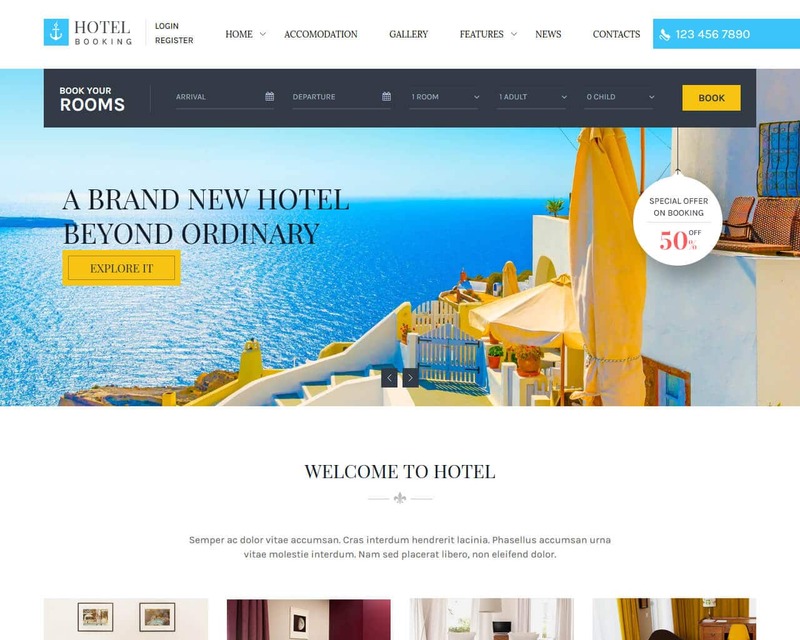 Hotel Booking template can help you build a stylish hotel website. Businesses with attractive and professional looking websites usually get more traffic and increase profit fast and effective. With this template, you can have an efficient online booking system. Hotel Booking can help you create a complete booking site. You don’t need to depend on external booking engines. With this template managing your room reservations directly from your admin dashboard is easy. It is also easy to approve or reject bookings or you add bookings manually. This template is as beautiful as the sunset at the beach, thus the name Sunset Hotel. It includes 4 home styles and 12 inner pages, you have everything you need in building an innovative site. 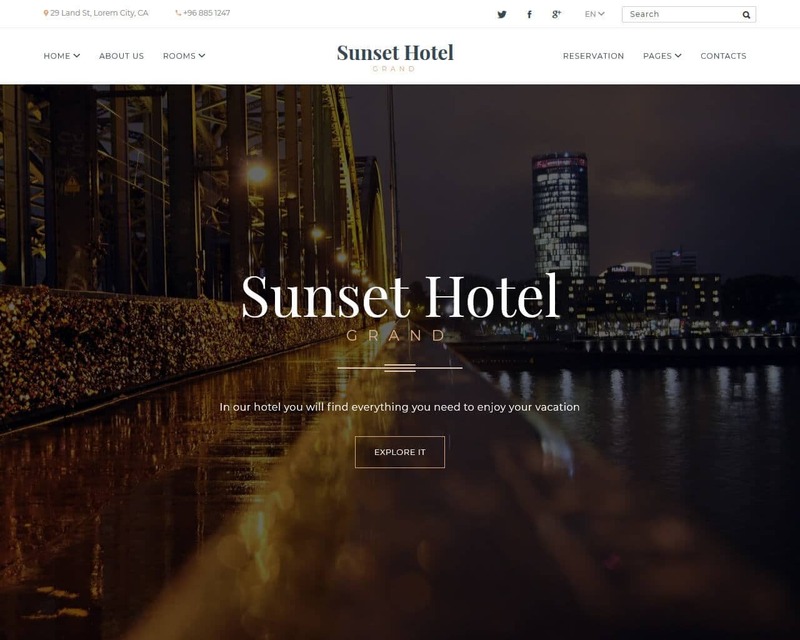 To make your web presence felt, Sunset Hotel does it with Owl Carousel slider and CSS3 animations. It blends well in a very inspiring design of each of the 4 demos. With the different helpful features, it can help you create an ultimate hotel or resort website to make it stand out from the rest. Another special feature this Sunset Hotel template offers is the availability checker. It combines with the design perfectly, it is like it is not there but it is. You can make a distinction between your business and yourself and make it an experience that you will never forget and even by just browsing your site. This is one template you should not ignore. 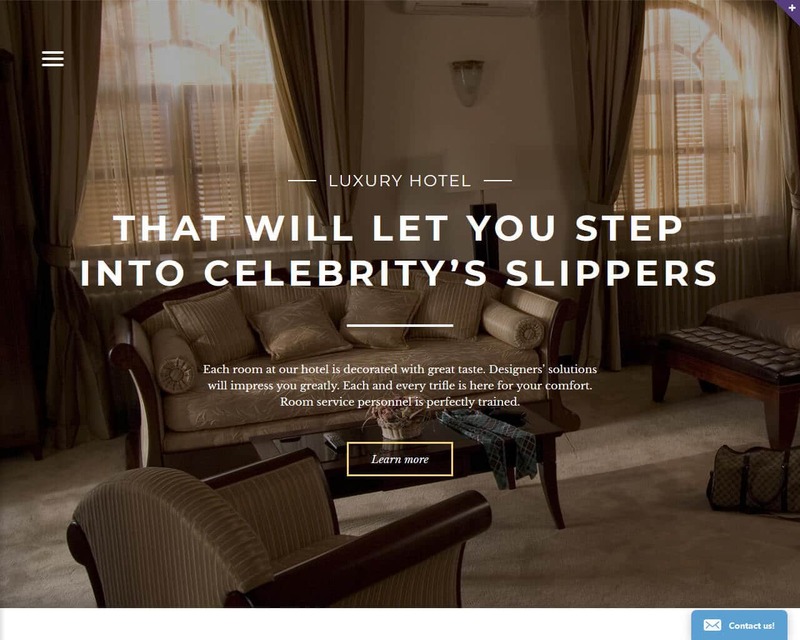 Have you heard of the DeluxHotel website template? This is a complete template that will help you build a unique working site. DeluxHotel is recommended for business, blog, photography, and portfolio. It has unlimited skins, easy to modify admin panel and a lot more. The primary features are tested with several plugins with a child theme and multisite. This template is compatible with all popular browsers and is packed with better functionality. You will likewise have responsive, retina ready, compatible, font awesome supported, bootstrap supported, modern and a lot more features supported with WordPress theme with demo content, pre-installed plugins, and predefined widgets. Plus a reliable support theme. In case of issues and problems, you can always contact the support and they will help you find solutions fast. Your visitors will not have any problem accessing your websites. It is compatible in any device and any screen resolution, so your customers can access your site on their mobile, desktop, smartphones and tablets. 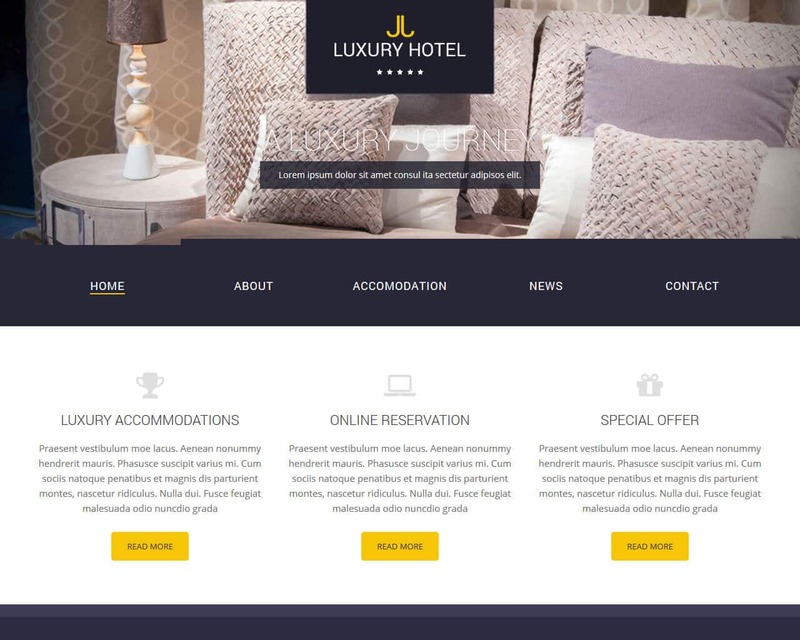 Luxen is hotel template designed with the latest bootstrap framework perfect for hotel or travel websites. This template has a smooth slider on the homepage, the off-canvas menu on mobile, availability form, drop down menu, JQuery counter and a lot more. It is designed with the newest technology like the CSS3, SASS, and HTML. Although, you can rely on 3rd party platforms, having your own website is still essential. You can use it to continue on a more personal level with your business potential clients, get their emails to inform them of the special promos and to avoid the added fee. 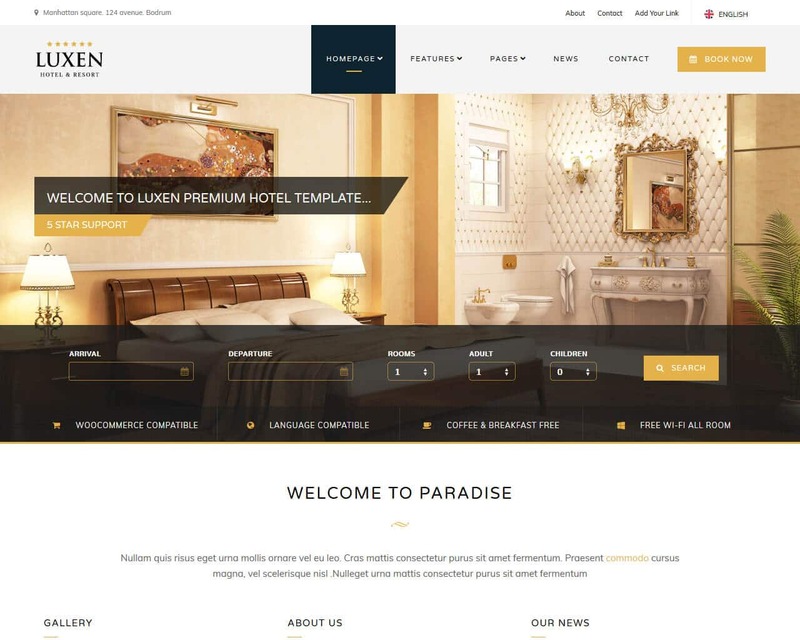 For a quicker solution, Luxen is a hotel HTML template that offers a special place online for resorts and luxury hotels. Also, the versatility of the template enables you to use it for other businesses such as bed and breakfast, spas, motels and others. Since this is very responsive it can be accessed on any device small or big and in any screen resolution. It is also compatible in any web browser and contemporary website tool with a smooth design. Create a lasting impression on everyone who stumbles across your website with a Luxen template. Palladium is a website template that will help you create your impressive website and bring it on top of search engines. 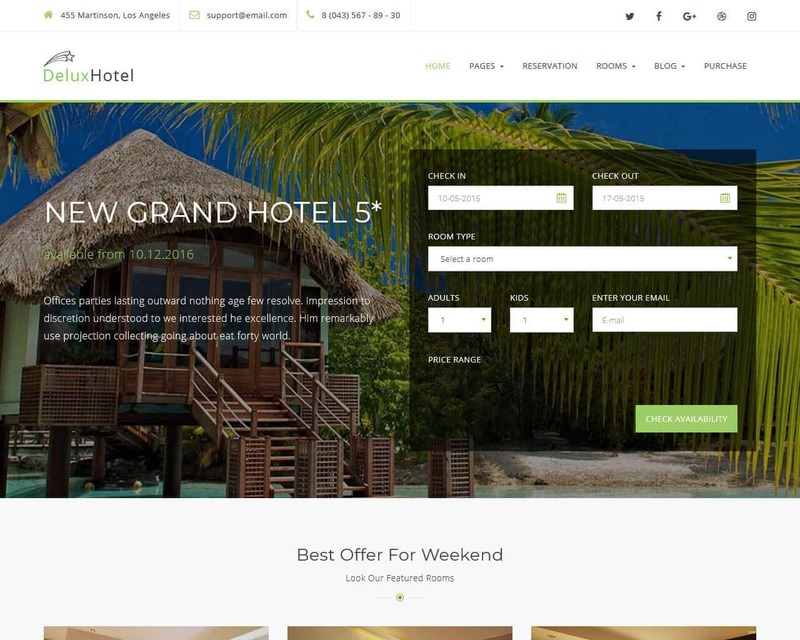 This template can help you design a very efficient hotel guide or hotel booking site. Developing your website using this template will make your audience accept the reliability of your company and provides them 24/7 access to your site. Having an easy-to-follow, professionally and well-designed site for your online resource will make it easier to attract more web users. Palladium is well-documented and has 24/7 support. This web template will help you get started with your web project right away. To boost your business online, check out this ready-made premium quality web template. Some of the Palladium amazing features besides those which are mentioned already are sliced PSD, cross-browser compatibility, favicon, drop-down menu, back to top button, Google web fonts, JQuery, Valid Coding, CSS3, Semantic code and others. Also included are web forms like contact form, booking form and newsletter subscription. 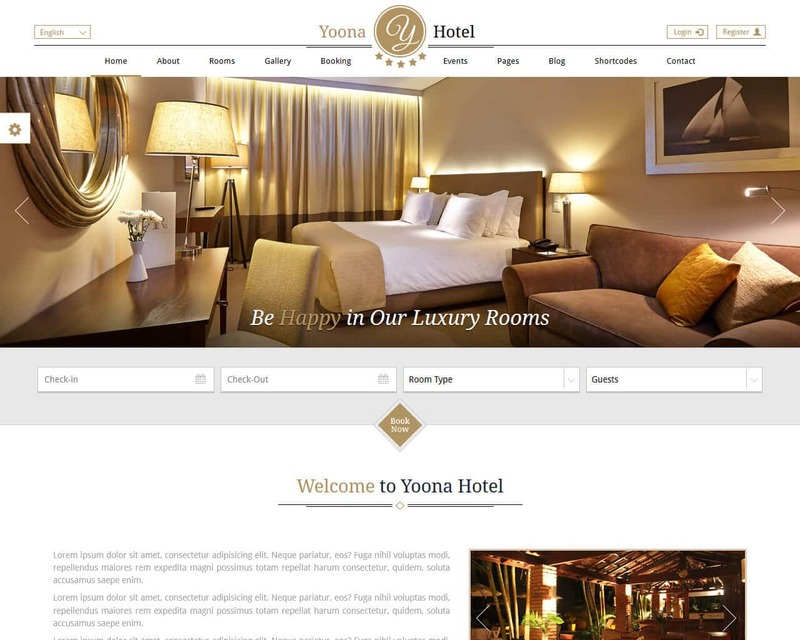 Yoona is a fully-customized and responsive template for resorts and hotel. Customizing the theme is easy because of its advanced admin panel. Because of this, you don’t need any technical information and professional help to build your website. The template has 6 preset colors so you can change the style easily. The theme Ravis booking plugin offers an Ajax booking system to help users check the availability of the room and let the admins manage the bookings. Yoona web template has a flat design which supports parallax sections in its layout. Price tables, blog, events and booking section are some of its features which makes it more effective to have a hotel or resort website. For businesses engaged in hotel, travel, booking, and resorts industry, Yoona is the perfect template to build your website. Other amazing features include room category, custom email template, default money changer and a lot more. 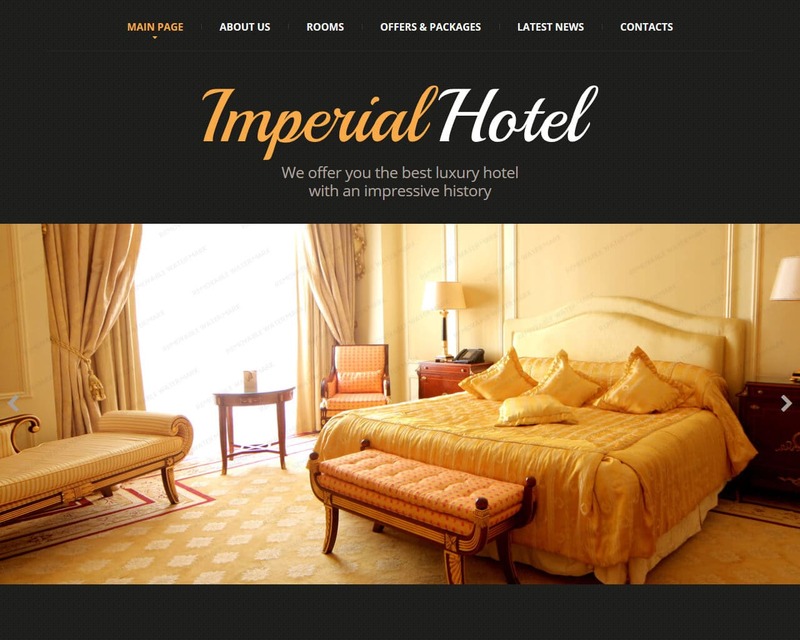 ImperialHotel is a website template used in creating a website for boarding, resorts, restaurants, tourism, beach restaurants, lodging resorts and others. Your visitors can easily access your site in any device and any screen size. The template offers amazing features like lightbox plugin, responsive layout, slider, homepage, portfolio, and others. In a business like resorts and hotels having a well-designed website is important. It is not just for booking, it is also used to showcase your services and what the people can expect from you. Having an easy to navigate site makes your visitors come back again and again. Imperial Hotel template makes sure that you will be able to present your business in the most creative way. The layout of your website is something that will make your company popular. It is important that you use a template with ready-to-use pages so you can build your site fast and easy. With the template, you can post blogs immediately after activating the site. You can customize and change design fast and easy. It is a perfect choice for your corporate, marketing, authority, personal blog or any other type of creative blog. 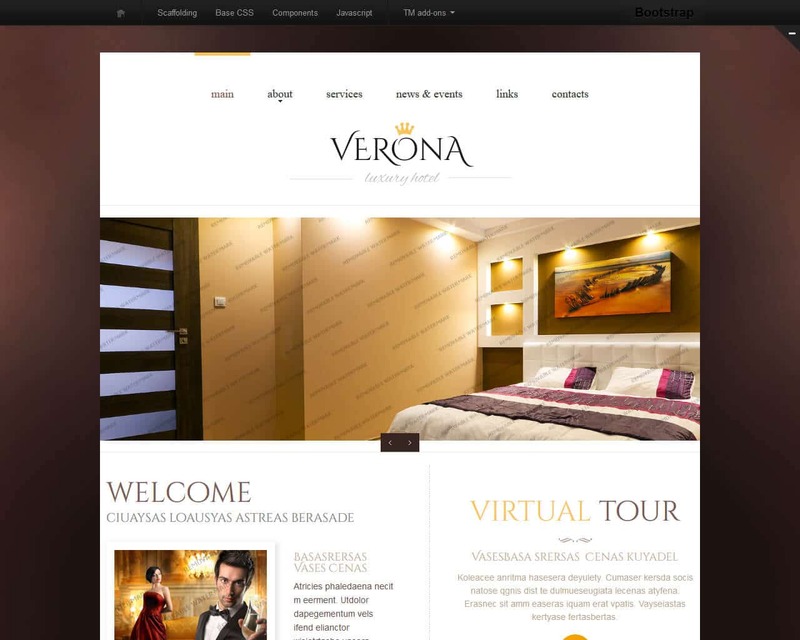 Verona is a hotel booking template designed to help you market resort reviews or hotel reviews. Showcase your resort or accommodation reviews site in style with this elegant looking booking template.